This book examines the place of multilateralism in Russia’s foreign policy and Russia’s engagement with multilateral institutions. Throughout the post-Soviet period, both Yeltsin and Putin consistently professed a deep attachment to the principles of multilateralism. However, multilateralism as a value, concept, strategy or general phenomenon in Russian foreign policy has hitherto been neglected by scholars, seldom assessed in its own right or from a comparative perspective. This book fills that gap, combining wider conceptual perspectives on the place of multilateralism in Russian foreign policy thought and action with detailed empirical case studies of Russian engagement at the global, transatlantic and European levels, and also in Russia’s regional environment. It examines Russia’s role and relationship with the UN, NATO, G8, EU, OSCE, Arctic Council, Eurasian Economic Community, Commonwealth of Independent States, Shanghai Cooperation Organization and Collective Security Treaty Organization, covering a wide range of issue areas including nuclear non-proliferation and trade. 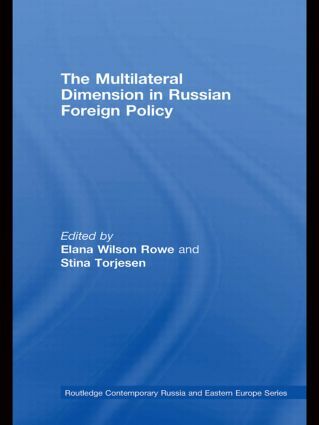 Throughout, it considers the political, economic and security interests that shape Russia’ foreign relations, conception of multilateralism and activity in multilateral settings. Overall, this book is an important resource for anyone interested in Russian foreign policy and its role in international relations more generally. Russia’s attitude towards nuclear non-proliferation regimes and institutions: An example of multilateralism? Russia and the OSCE: From high expectations to denial? Russia, the CIS and the EEC: Finally getting it right?